I've been searching for an iPhone app that could wake a computer outside the LAN. After installing a few apps, I discovered WOL Control. 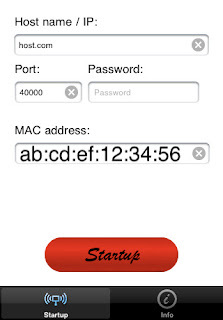 The dots in the mac address are added automatically and the computer info (ip/host, port, mac) is remembered. It small, simple, easy to use and IT WORKS!